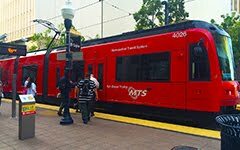 The Daily Aztec : Public transportation lags behind for commuters: "The county of San Diego is not a small piece of land that’s easily accessible via public transportation. Without a car, commuting to and from San Diego State can be burdensome and even costly. San Diego’s inefficient and limited public transportation system only makes matters more difficult for students. Students who commute should have accessibility to inexpensive and efficient transportation around San Diego. If students aren’t stressing about traffic and rush hour in parking structures, they are depending on the trolley or the bus to get around — but the price paid by students doesn’t just come from their wallets."